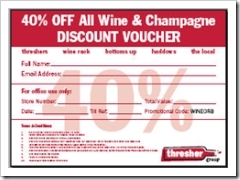 No need for booze cruises, as Neville Hobson points out, because Threshers is giving bloggers a whopping 40% discount on all wine and champagne bought between 30 November – 10 December. This offer is particularly novel as it is not being advertised or promoted anywhere other than blogsphere, not even in their own stores. The voucher you need can be downloaded here. This was kickstarted by Hugh MacLeod of Gapingvoid and is an interesting viral marketing story. I’m hoping to meet up with Hugh again later this week at my first girlie geek dinner which blogging guru Robert Scoble will be attending with his wife Maryam, who also blogs. Bearing in mind that most supermarkets now offer huge discounts on booze, is this enough to tempt you? At least you get to choose your favourite tipple. yea but guys people are not realy bothered if there only realy 7.67% discount they look at 40% discout and woo there high as a kite i dont think the brain actualy takes in the 7.67% it just sees the 40% and overloads. The hits continue to soar astonomically. Yesterday I had another record day with 1,222 hits, including 146 returning visitors (the most ever) and 919 unique, mostly as a result of this post. It really is incredible. Harry’s Place also highlighted this offer and I had a very large amount of traffic from his site. Don’t waste your discount on things included in 3 for 2 offers. Buy a few bottles of spirits instead. I’ve seen a traffic surge, and it’s almost entirely related to certain keywords to do with this. Jimbo, Many thanks, you’ve obviously done your homework here, all that glitters is not gold, so it seems. Oh, and I can fill the car with diesel cheaply too…. Guys, this is a marketing wheeze which is clearly succeeding. 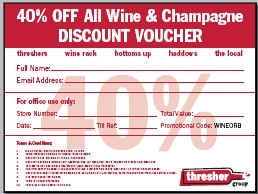 You get 3 for 2 at all Threshers on wine and champagne = 33% discount. Thus the 40% discount is actually only 7%. Maximum spend £500 per person = £35 maximum saving. Suckers….. For £35 I can get to France and back on a free ticket and get good vino at Carrefour for half the price. I had a record number of hits yesterday as a result of this story being picked up by other bloggers who linked to my site, including Tim Worstall, Devil’s Kitchen, Tim Almond, Mr Eugenides and British Blogs – I had about 600 unique hits and 102 returning visitors. It will be interesting to know how many bloggers ran the story, how many people took up the offer. Someone certainly knows the power of blogging! Not sure about that, Murdoch. I just did a comparison on superplonk.com, and the ones on there were mostly priced around the same mark as other wine merchants, and often close to supermarket. Certainly enough to cover 40%. I don’t know much about the retail end of wine, but I can’t believe they can sustain a 40% drop in price. But it looks like a bit of a price war is on. Beer is down in price with Morrison’s selling Stella Artois for 62p/pint. Sainsburys online are doing 25% off all wine by the case. But then, that’s not my problem. Jim, You don’t have to prove anything, by reading this, you are a blogger. I guess they want to test viral marketing. Iain, Many thanks, I have forwarded it to Julian, they are obviously worried about us! How can you prove you’re a blogger? There could easily be non-bloggers reading this who have downloaded the voucher! Murdoch makes an excellent point – no such thing as a free lunch (or cheap booze) – it’s axiomatic! Moreover, by supplying your email address – expect a lot more commercial spam! 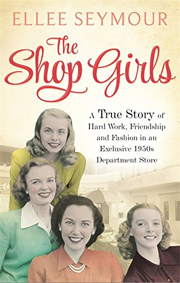 I just adore a good sale! Useful, perhaps, but not that good as Thresher’s is expensive. Their business model is having relatively high prices on individual bottles and duly offering three for the price of two which makes the overall price more reasonable. 3 for 2 is a 33% discount and is specifically excluded here so this voucher is effectively something like a 5% to 8% discount in practice depending on what’s bought. Good idea, Ellee. I think I’ll do that. Bel, Why don’t you put your name on the waiting list and see if you can come along too? Have fun, Ellee. I love both the Gaping Void and Scobleizer blogs. Eagerly awaiting your write-up! James, It must be cheaper in Russia, do you enjoy the vodka? Let’s go out and get sloshed now.